Acne blemishes fall into two categories, depending on whether or not they cause inflammation of the surrounding skin. Noninflammatory acne (such as: whiteheads, blackheads) and Inflammatory acne (such as: papules, pustules, nodules, cysts). Topical creams and oral medications may be effective treatments for acne outbreaks, but may dry and irritate sensitive skin. What’s more, acne that occurs on backs and chests may be difficult to treat topically because of the large surface area. Treating acne with laser & pulsed light may deliver better aesthetic results, without the side effects associated with topical and oral acne medications. 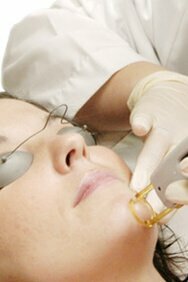 You may also treat scars resulting from acne outbreaks with fractional laser skin resurfacing. Acne IPL treatments with Palomar® StarLux500 and blue light laser technologies target skin bacteria responsible for acne to help prevent future breakouts from occurring on faces, chests and backs. Our technologies deliver just the right amount of light in the right spot size for your treatment needs, while our Advanced Contact Cooling technology protects clients’ skin. Palomar’s IPL and Blue light Laser treatments prevent future acne breakouts and deliver a spectrum of light that is absorbed by porphyrins within skin, destroying acnes bacteria and inhibiting future acne breakouts. This clarifying formula contains A vitamin and gingko biloba, known for their sebum-regulating action, as well as B vitamin complex and hyaluronic acid, known for their hydrating* action. Sterile product. Preservatives free. WHAT ARE THE BENEFITS OF USING MESO FOR ACNE? Meso ACNE contains active ingredients that make the skin clearer by limiting excessive sebum activity. You’ll notice the difference from the very first session. The improvements may become more apparent over time, we recommend therefore having several sessions. WHAT KIND OF RESULTS MAY YOU EXPECT? Excellent service and results over the past 2 years!! 🌼 I’ve struggled with a myriad of skin issues and I feel like a totally different person now. Highly recommend! This clinic is so amazing because the services you’re getting are such a good piece, making it affordable.